Well, this one crept up from nowhere on me. Given that I only live a relatively modest stroll from this hotel, the conversion of the former Regency Hotel into the DoubleTree by Hilton London Kensington passed me by. 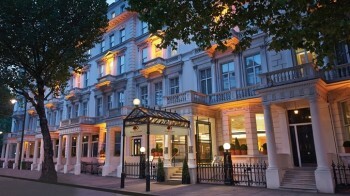 The hotel has just re-opened following a £10 million refurbishment. It is located on Queens Gate (a fairly busy road with a number of hotels on it) and a very modest walk from Hyde Park and the South Kensington museums. At present, it looks pretty cheap. On Tuesday 19th January, for example, you can get a room for £130. The room isn’t huge – just 17 square metres. It has been fully refurbished, however. They have suites from just £175 although, at just 26 square metres, that description may be pushing it a little. There are some two-level duplex suites which may be interesting – Crowne Plaza Kensington also has some of these. If you are looking to redeem your Hilton HHonors points, it will cost 50,000 points per night. The hotel home page is here if you want to learn more. Stayed here on Tuesday. Did not realise it was new but that explains the £120 cost. With hindsight, this explains a few things. Lots of trainee staff, check-in was very slow with the one person who knew what they were doing checking in two people at a time but not any quicker. Room was very small (King Executive). No Diamond benefits offered although when I asked, free breakfast was. No room upgrade even though the hotel was at less than 50% occupancy. The bathroom was tiny with a 3/4 size bath and an ill-fitting shower curtain that filled the bottom of the bath waiting to trip you up. Overall, most of the problems will quickly be overcome. But this is by no means anything special given the cost and given the full Kensington Hilton adjacent to the tube stop avoiding the walk. Problems that cannot be overcome was outside noise, that was excessive (the new Intercontinental O2 shows what can be done with soundproofing if you put your mind to it) and that the rooms are very small, even if they are comfortable. I’m with the original poster and will stick with the C/P in future. Thanks Harry, appreciate some real-world feedback.